-After a slow start, the Crunch are on a 3 game winning streak, coming off a shutout of Bridgeport on Saturday evening at home. -The Crunch leadership has a distinct River Rat flavor: captain Mike Angelidis spent four years in Albany during the Carolina years (2006-10), while assistant captain Joey Mormina spent one season in the Capital District (2007-08). 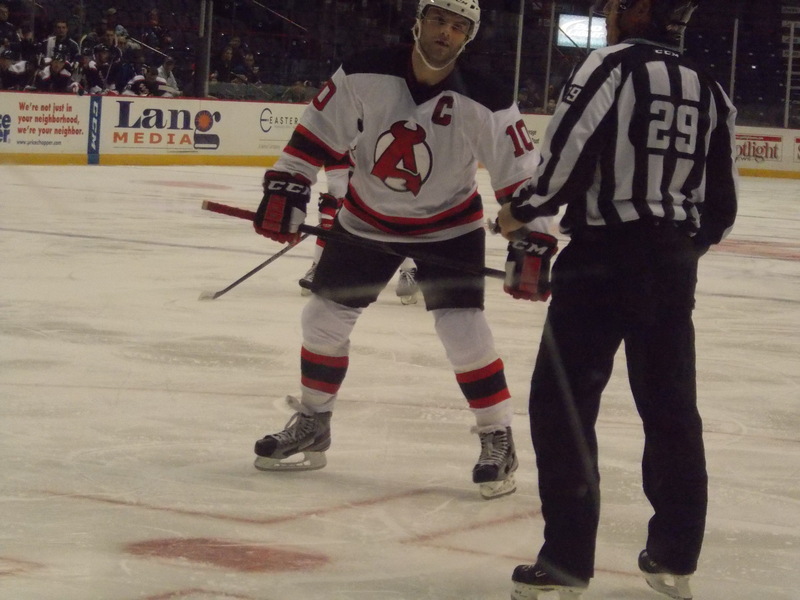 Also on the roster: former Devil Matt Taormina. 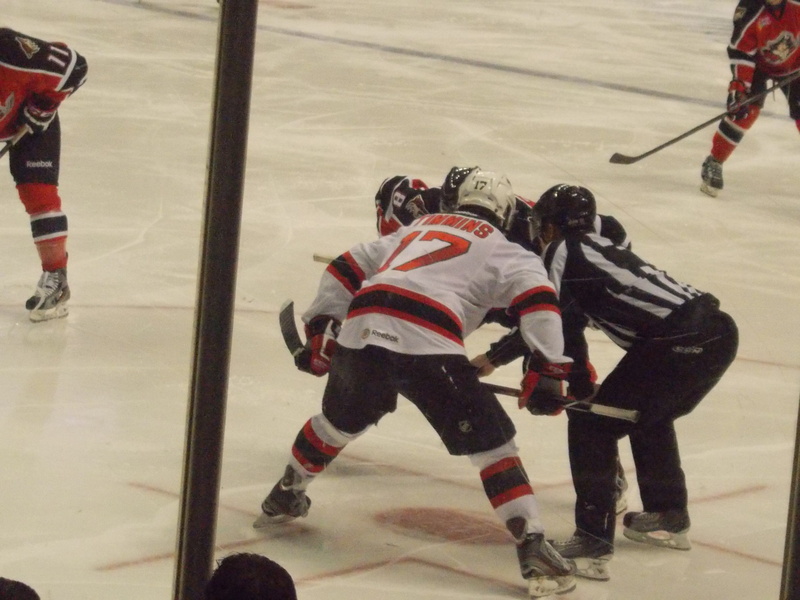 The week began with the first ever trip for the Devils to Utica to take on the Comets, in their inaugural home opener. And it was all Devils from the beginning, outshooting the hosts 10-5 and scoring twice. Joe Whitney and Jon Merrill (on a power play) scored 26 seconds apart 8 minutes into the period for the two goal advantage. Chris McKelvie would add his first of the season halfway through the 3rd for a 3 goal cushion. The Comets would break up Keith Kinkaid’s shutout bid with just under 7 minutes to go in the game, but Whitney would add his second of the night on an empty netter with 32 seconds left to seal the Devils second straight win and fifth game with at least one standings point. Kinkaid stopped 22 of 23 shots in picking up his second win of the season. Reid Boucher added two assists, and Scott Timmins notched an assist to continue his season long point scoring streak. *-I was not around to listen in/watch, all the info I had was from the official scoresheet. Some of these are guesses/possible process of elimination. 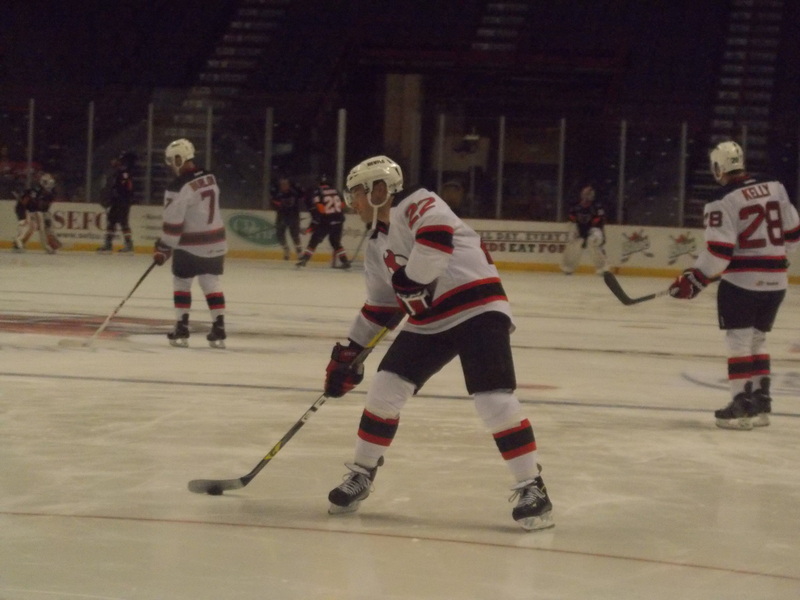 It was back home for the first time in 11 days as the Devils welcomed the Wolfpack to start a 4 game homestand…and to avenge the loss on Opening Day three weeks earlier. 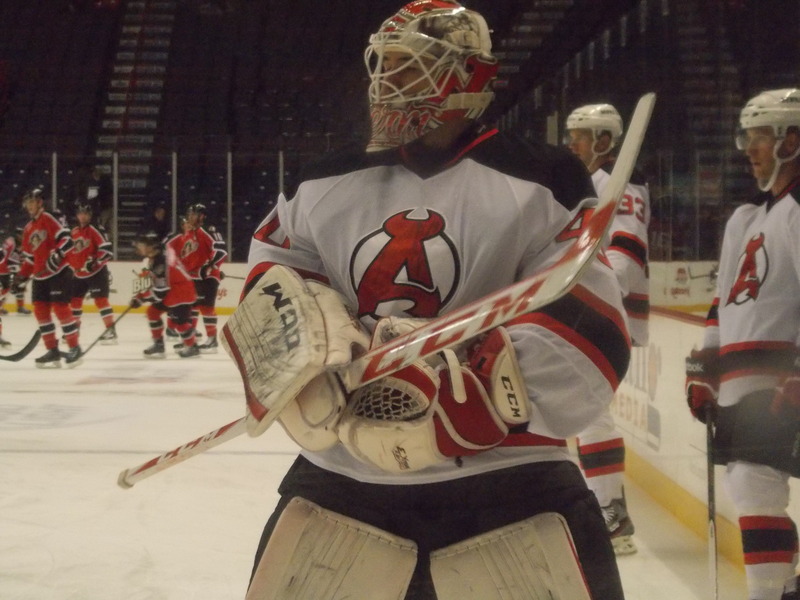 Harri Pesonen had a chance to give Albany the early lead when he was awarded a penalty shot, but was denied by Wolfpack goaltender Jeff Malcolm (who was making his pro debut…I just figured Hartford had an open casting call before heading west for goaltending with both regulars up with the Rangers). Ryan Bourque would give the Wolfpack a 1-0 lead halfway through the period. Mike Hoeffel, in just his second game of the season, would score his first of the season late in the period to tie it at 1. Second period was all Albany, as they scored 3 times and outshot Hartford 11-4. 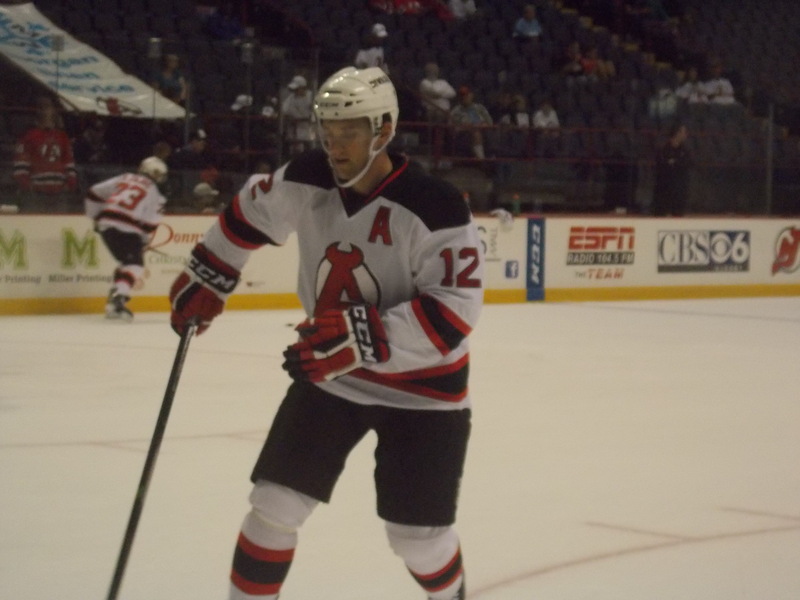 Stefan Matteau finally scored his first of the season to put Albany up 2-1. Jon Merrill would follow up with a power play goal (his second of the week) for a 3-1 advantage. To top it off, Scott Timmins continued his season long point streak with his fourth goal of the season for a 4-1 (yes the dreaded three goal) lead. The Wolfpack showed some signs of life in the third after switching goaltenders to start. Pesonen was awarded his second penalty shot of the game early on in the period, but was denied yet again. Nearly 30 seconds later, Andrew Rowe scored to cut the lead to 4-2. With the goaltender pulled late and on a power play to close the game, Aaron Johnson would score to make it a 4-3 game. 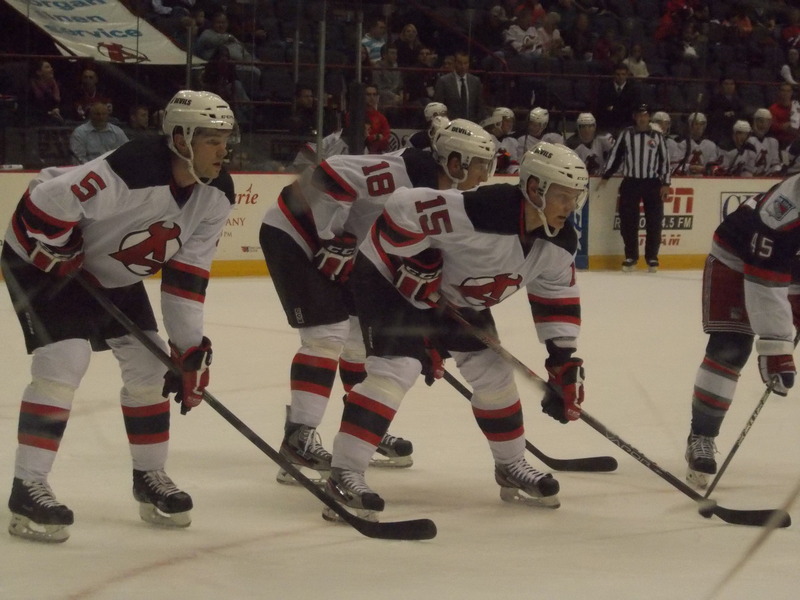 But that’s all Hartford could do, and the Devils held on for their third straight win. 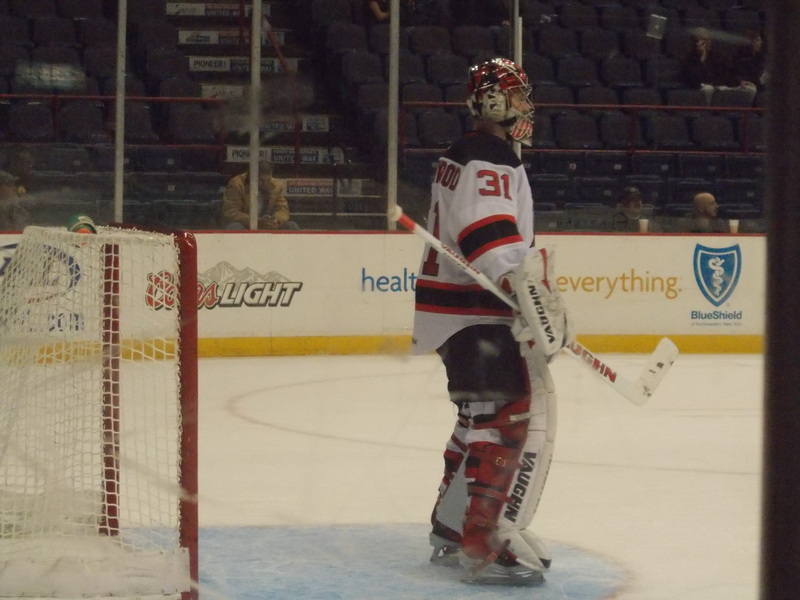 Scott Wedgewood played solid in his third victory of the season, stopping 23 of 26 shots. Six Devils all added one assist each. I did see McKelvie-Sestito, Pelley-Timmins, and Zajac-McKelvie on the penalty kill, also a Wohlberg-Hoeffel-Matteau line at one point. To finish out the week, the Devils welcomed the Pirates for the first of four matchups. Jordan Martinook gave the visitors an early 1-0 lead on a shorthanded breakaway shot past Scott Wedgewood. Then quite the scary moment happened late in the period, as Seth Helgeson sent Jordan Szwarz into the glass…and shattering it all over a poor family in Section 103 (watch for it here around the :58 mark), causing the game to go to intermission early for cleanup and tending to the injured. Once everything settled down, it was back to hockey. Scott Timmins continued his scoring streak with his 6th to tie the game at 1 8 minutes into the regular 2nd period. But Gilbert Brule would give the Pirates the lead back nearly two minutes later on a power play. Reid Boucher would retie the game 5 minutes into the third with his second of the season, but Brett Hextall would put Portland up for good with 9 minutes left. He would add the first of 2 empty net goals late in the third (the first shorthanded) to give the Pirates the win. Not the greatest of days on special teams…0 for 6 on the power play with 2 shorthanded goals allowed, but 4 for 5 on penalty kills (despite what seemed like some very one sided calls from the referee as well). 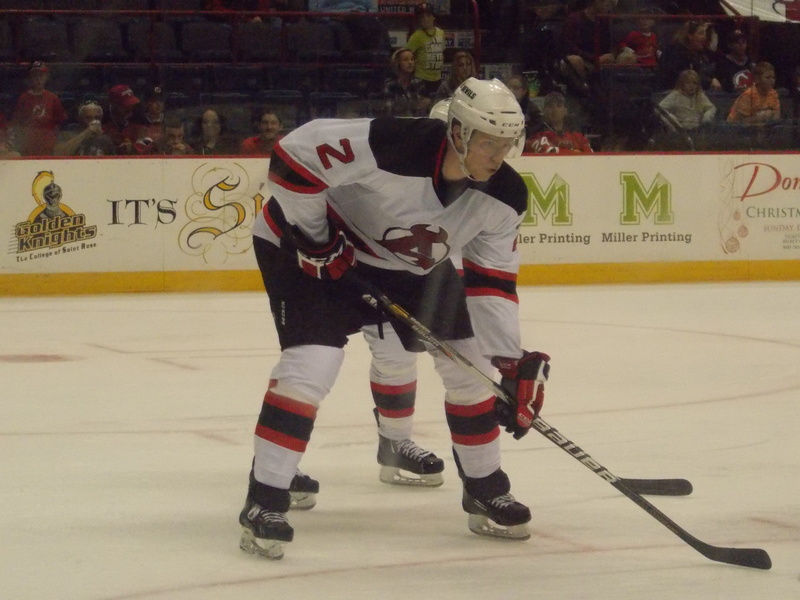 Wedgewood stopped 20 of 23 Portland shots in a hard luck defeat, while four Devils contributed one assist each. I did see a Zajac-Matteau-Hoeffel PP combo and Hoeffel take Janssen’s spot with McKelvie/Zajac as well. I ended up splitting it between two members of what I’m considering to be the top line: Joe Whitney and Scott Timmins. Whitney scored three times (2 in Utica on Wednesday), while Timmins is continuing his stellar start to the season by registering a point in all 8 games so far. -The first callup came on Wednesday, and not surprising it was Eric Gelinas answering the call, filling in for Bryce Salvador (personal). He made his season debut Thursday night against the Canucks at The Rock, scoring his first NHL goal (on, naturally, a power play) in a shootout loss to the Canucks. He also played in New Jersey’s comeback win over Boston on Saturday night before being reassigned to Albany earlier today. -Keith Kinkaid became callup #2 when he was summoned to New Jersey to backup Martin Brodeur in Boston with Cory Schneider out. He too was reassigned to Albany this morning. 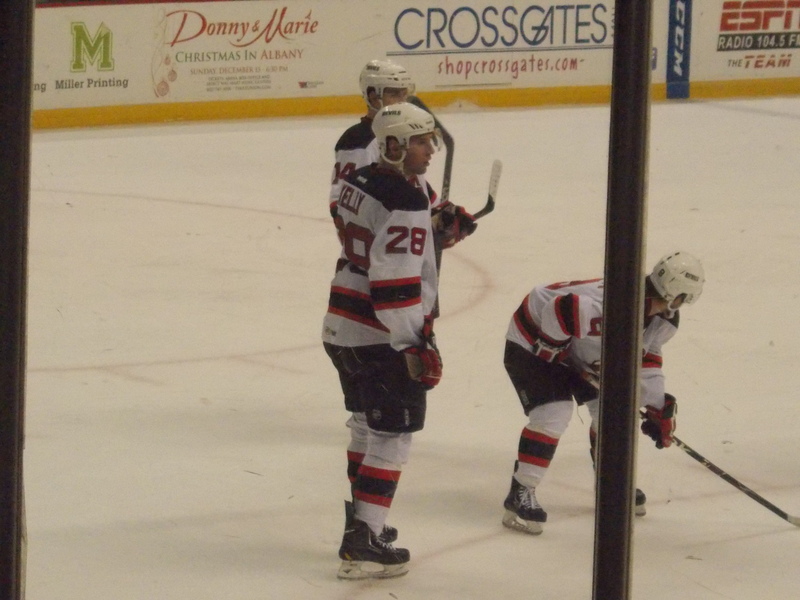 -Kelly Zajac was the last member of the roster to get in a game, making his season debut Wednesday in Utica filling in for his injured older brother and notching an assist. -Speaking of Darcy, it appears he will be out indefinitely after getting injured Saturday night in Norfolk. 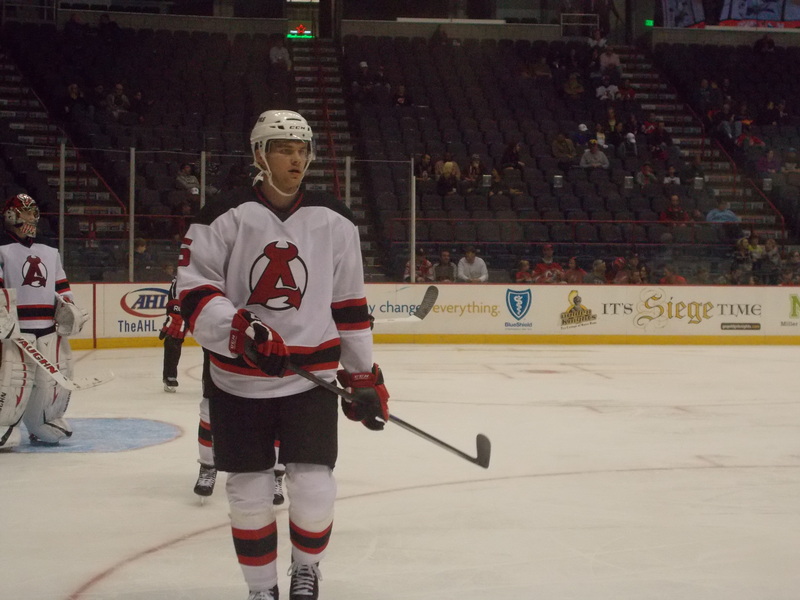 Mike Sislo also sat out all three games after getting hurt in Norfolk, but he should begin skating again next week. Another busy 3 game week. Wednesday the defending Eastern Conference champions from Syracuse make their first visit of the season. Friday night Norfolk comes in for their third matchup to kick off November. Finally on Saturday, the first regular season visit to Glens Falls to take on the Phantoms. -Portland is coming off its first win of the season on Wednesday night against Hartford. -Due to an ongoing legal battle with its regular home the Cumberland County Civic Center, the Pirates have temporarily moved up to Lewiston for its entire home schedule. -The Wolfpack finally suffered its first regulation loss on Wednesday night at home against Portland. 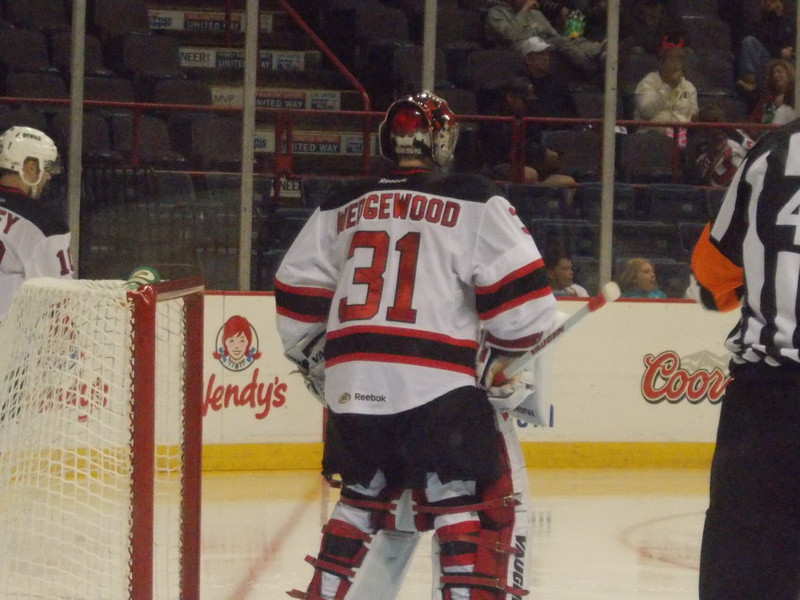 -Hartford has also seen both goaltenders (Cam Talbot & Jason Missiaen) and 3 of its forwards (Brandon Mashinter, J.T. Miller, Chris Kreider) recalled to the Rangers this week due to injuries and early season struggles. -It’s the official home opener for the Comets, the last team in the AHL to play on home ice. -Utica is also the last team without a standings point, after losing their 3rd straight to Rochester Saturday night.